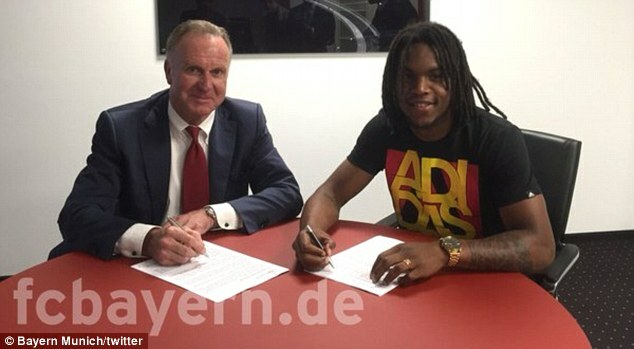 On 10 May 2016, Sanches signed a five-year contract effective 1 July with German club Bayern Munich for €35 million,in a deal totalling €80 million, with the additional €45 million depending on objectives.With this transfer he became the most expensive Portuguese player to leave the domestic league, as well as the first Portuguese player to join the Bavarian side.The initial fee was the fourth-highest paid in Bayern Munich's history, after those for Javi Martínez, Mario Götze and Arturo Vidal. Last edited by IsiahRashad on Fri Jun 03, 2016 8:42 am, edited 1 time in total. I dont know if anyone mentioned this... This is the second time that we bought from a champs league opponent which we met..
ramsej84 wrote: I dont know if anyone mentioned this... This is the second time that we bought from a champs league opponent which we met.. He's 7 days older than me! Renato: Can I come in? MUTU: Well, it's 13.05, and technically speaking, no one can enter until the end of the season. But that's OK. Come in now.Pep is not here at the moment, so he won't see me letting you enter few days early. Sorry guys MUTU's orders just wait till its official. The reason why I don't open them is that until he's a player generally there's nothing posted in the player thread that belongs to the player thread. The Benfica midfielder, who will join Bayern Munich this summer, has surpassed Ronaldo by becoming the youngest player in a Portugal squad for a major tournament. And at the age of 18 years and ten months, Sanches has surpassed Ronaldo’s record to become the youngest player to be part of Portugal’s squad for a senior international tournament. Ronaldo set the record ahead of Euro 2004 when he was named in Portugal’s squad at the age of 19 years and four months. When can we open that regular Renato Sanches topic?? Bc it seems silly to talk about him as a player in this topic...Especially with the Euros coming up. He came on halfway through the second half vs England. Had a few good moments, especially in the first few minutes after his substitution. As he used his strength to breeze past some England players...Bull is the word that kept popping up in my head whenever I saw him on the pitch tonight.